Sigma Young Talent starts another Talent Program. This time in engineering. Once again, Sigma Young Talent is delivering a talent program that meets Ascom’s need for engineers of the future. Ascom is a communication solutions provider focused on mobile workflow with the vision to close digital information gaps, allowing for the best possible decisions – anytime, anywhere. As a provider at the forefront of technical innovation, their need for skilled employees is paramount, both in the short and long-term. In order to attract the best employees, an introductory capability development program has started together with Sigma Young Talent in Gothenburg. The program aims to deliver growth and future-proof specialist competencies in R&D and Engineering for Ascom. – We are in a phase of growing and we can offer exciting opportunities working with the latest technologies. For us, this talent program is a new way of recruiting, where we see the advantages of using a partner who has already established contact channels with the students, says Patrik Hartvig, VP Global Product Line Mobility at Ascom. Participants in the talent program will be given training and coaching in parallel with their regular work. It offers a unique chance to get a good start to their career. The areas of expertise on which the program focuses are mechanical product engineers, quality engineers and developers within R&D. The program will launch in Q1-2019 and recruitment has already begun. – It's great working together with Ascom to develop a talent program for newly graduated engineers. The program gives candidates a flying start to their career. Participants are given a chance of development in an optimal way by combining practice and theory. A talent program is a great way to attract top-employees, says Pernilla Johansson, Executive Vice President Sigma Young Talent. The picture shows employees from Ascom together with representatives from Sigma Young Talent. 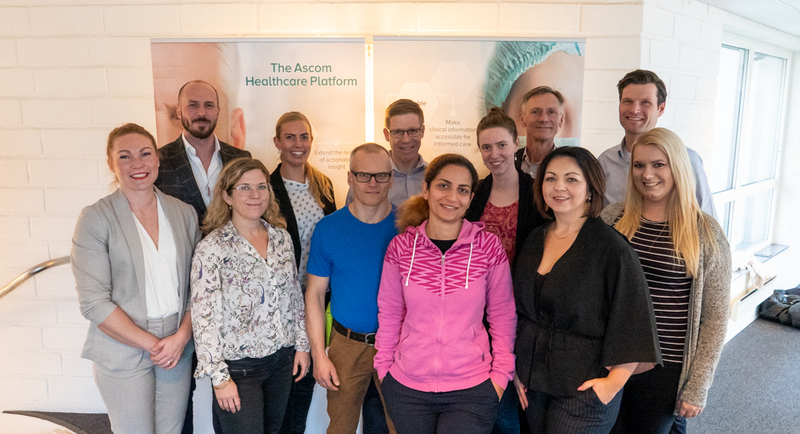 Ascom Sweden AB is a part of the Ascom Group, a global solutions provider focused on healthcare ICT and mobile workflow solutions. The vision of Ascom is to close digital information gaps allowing for the best possible decisions – anytime and anywhere. Ascom’s mission is to provide mission-critical, real-time solutions for highly mobile, ad hoc, and time-sensitive environments. Ascom uses its unique product and solutions portfolio and software architecture capabilities to devise integration and mobilization solutions that provide truly smooth, complete and efficient workflows for healthcare as well as for industry, security and retail sectors. Ascom is headquartered in Baar (Switzerland), has operating businesses in 18 countries and employs around 1,300 people worldwide. Ascom registered shares (ASCN) are listed on the SIX Swiss Exchange in Zurich. For more information about Ascom visist www.ascom.com. Sigma Young Talent focuses on individuals at the start of their career in IT and engineering, offering junior consultants, consultant recruitment and talent program. Sigma Young Talent is part of the Sigma Group, which consists of leading consultancy companies with the aim of making their customers more competitive. To get there and keep that promise, Sigma combines its technical know-how, excellence and passion to constantly develop new and better solutions. Sigma has over 4400 employees in twelve countries and is owned by the Dan Olofsson family holding company Danir AB.